A beaming smile tells a tale where words might fail: Bob Allin knows he’s blessed. At 69, he finds himself surrounded by loving family – expanded now to include three grandchildren (whose mention brings an inevitable twinkle to grandpa’s eye) – as well as his wife, Lesley, and two grown daughters. He’s woven himself deeply into the community fabric of Port Perry through years of service as a physician and Rotarian. And his wise choice of vocation is underlined by that smile, which forms again as he describes the professional fulfillment he continues to feel strongly at an age when many others would opt for retirement. “Family physician” may be Bob’s most commonly recognized title, but medically speaking, far from his only portfolio. With responsibilities as an anesthesiologist, coroner, and teacher, Bob Allin maintains a rigourous work schedule. The road to a medical career began beyond our town: it ran from a farm near rural Bowmanville, made a brief detour into Western Canada and a short stop in another Ontario community. Choosing not to follow in his father’s farming footsteps, Bob gravitated instead to a professional path where he could capitalize on his strength in high school sciences. Bob’s initial posting, after completing his internship, was in Vancouver. But, he soon discovered there was too much of the small-town boy in the young doctor. Brooklin – much closer to family and reminiscent of his hometown – beckoned. This more satisfying site soon revealed an interesting patient demographic which, ultimately, would guide the fledgling physician to his lifetime location. Along with two colleagues, Dr. Bill Cohoon and Dr. Ralph Price, Port Perry’s Medical Associates was born. As Bob and his co-founders had predicted, the new clinic did contribute to the health of the Port Perry Hospital. Bob Allin again played a role, as a member of its Board of Directors. Toronto. Bill (Dr. Cohoon) served as liaison with the university, so when an agreement was finalized, we began instructing residents. Today, Port Perry is the U of T’s most senior teaching facility,” he says proudly. 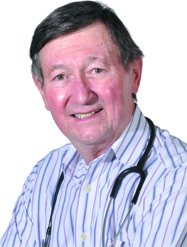 Dr. Cohoon proposed performing minor surgery in Port Perry and it was this initiative which allowed Bob to begin diversifying his career beyond family practice, as a surgeon, inevitably, needs an anesthetist. anesthesiology. But you won’t hear a trace of impatience in his tone while explaining this highly technical and demanding medical role. An anesthetist remains in charge of the patient’s vital signs – breathing, heart rate, blood pressure – during any procedure. Each element is manually charted. In addition, the level of sedation must be closely monitored throughout, demanding unbroken concentration as well as close communication with the surgeon. Health and age have, historically, been key factors in determining whether or not to proceed with surgery. As a person ages, the vital organs lose efficiency, creating greater risk under anesthetic. But despite these unchanged medical facts, Bob indicates there has been a significant shift in attitude on both sides of the scalpel, even for the elderly. “People live longer now, for one thing. And the public has a desire – you could almost call it expectation – that if a surgical option exists, the doctor should go ahead. His busy professional schedule extends beyond family practice, anesthesiology, and teaching to include a “sideline,” one which inevitably invites curious questioning – among medical professionals and magazine writers alike. The Coroner’s function has evolved considerably from its origins in old England (where the title may have been “crowner”) when he was charged with gathering the King’s taxes from the expired. The modern practitioner, Bob explains, is a medical investigator. One in four deaths will require a coroner’s examination, and among those, Bob will order one autopsy. Like his interest in medicine, Bob developed an affinity for community service as an adolescent. His involvement began as a high school student awarded a trip to Kingston’s Queens University to study the United Nations. Bob would repay the favour of his youthful experience to another generation of teenagers when he continued his involvement as an adult. As Youth Exchange Chair, he coordinated a program which allowed year-long exchanges with young overseas Rotarians. Bob remains a charter member of Port Perry’s Rotary Club. Only the weight of his professional commitments precluded long-term membership in the group’s executive. And with his schedule, who would question that decision? Outright “retirement” isn’t yet listed in this devoted physician’s lexicon. But when that “right” time to retire does arrive, Bob expects to continue with a busy schedule – though of a much different kind. Some people place value on a job’s prestige or income potential. But others would argue – and Bob Allin surely numbers among them – that personal fulfillment remains one of life’s greatest rewards. Only a few can say with conviction – 50 years along a demanding career path – that they enjoy their work as passionately as ever. Port Perry can be thankful to claim one of this rare breed as its own.